The acceleration of the Bolivarian project – in both ideological and organisational terms, has fuelled concerns over the deepening of the government’s authoritarian tendencies. 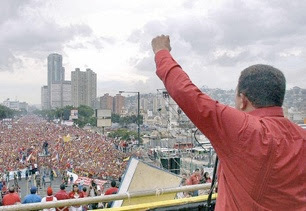 Established cynics in the media, who have seen leftwing ideals rise and fall, and opponents in the anti-Chávez movement have been quick to point to a frightening new twist in the evolution of the Chávez government. This is seen to be represented by the recent granting of decree powers to President Chávez, the move to extend state control over key sectors of the economy and the debate over the formation of the PSUV. However, it is at this point that the delineation between popular perceptions of democracy on the ground in Venezuela, and “elite” perceptions, articulated by the media and US “democracy-promotion” groups are revealed. There is widespread popular support for this new trajectory in Venezuelan politics. The creation of the PSUV is seen to be in line with the demands of grassroots groups to have more influence within the organisational framework of the Boliviarian project, while Chávez’s use of decree powers to revise the institutional structures of the state responds to grassroots pressure for more influence, power and resources at the community level. Put simply, many Venezuelans think they are getting more and better democracy through “21st-century socialism”, not less.